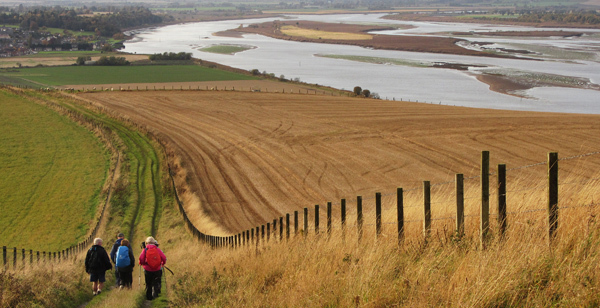 Forth Valley, Fife and Tayside Area has 13 Ramblers Groups and, at the most recent count, around 1,400 members. We offer a wide selection of walks suitable for people with different levels of experience and fitness both at weekends and during the week. From family walks to walks for dog walkers and leisurely walks to challenging days up Munros, there's something for everyone. We extend a warm welcome to all new walkers, visitors and guests. You can walk with any group, please have a look at our list of walks and if you think you'd enjoy joining us, get in touch with the relevant group to check the walk is on and come along! We also produces a 6-monthly Area Joint Programme, published in April and October. This can be downloaded here. Based in central Fife, the club likes to be known as "the friendly club". There are short walks every Thursday and longer walks most weekends. Perth & District Group is an active and friendly group with an all year round programme of walks in the beautiful hills, countryside and coast of Perthshire, Angus and Fife. A group based in the Tayside area aimed mainly at individuals in their 20s, 30s and 40s. Everyone welcome. Our groups help local people enjoy walking and protect the places we all love to walk. Most groups organise regular walks led by local experts – a great way to get outside, make new friends and discover how walking boosts your health and happiness. Join the Ramblers and become a member of Forth Valley, Fife & Tayside Area.